Rabies is a potentially fatal disease caused by a virus. It is transmitted to humans from animals, both wild and domestic, though it is widely believed that more than 99% of all human deaths from rabies are caused by dogs. It is spread by close contact with infectious material, usually saliva, via bites or scratches causing a break in the skin. 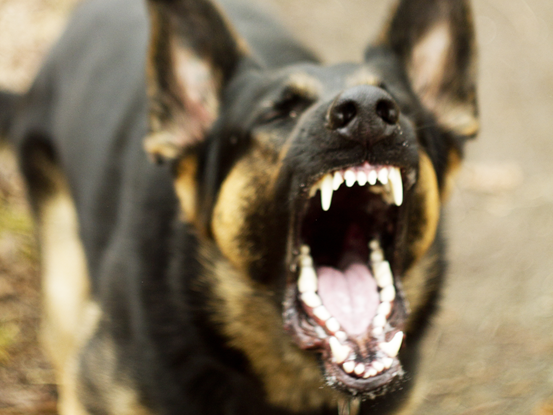 Rabies kills more than 50,000 people each year. If left untreated, it has a mortality rate approaching 100%. Rabies is found on all continents except Antarctica, but 95% of human deaths occur in Asia and Africa – India alone accounts for around 35% of all deaths. Most developed countries have eliminated rabies from their dog populations. It is principally a disease of poor and vulnerable people, especially children, living in remote rural communities. These deaths are rarely reported, resulting in poor influx of aid to these areas. Dogs are the main host and transmitter of rabies – they pass on the infection by bites or scratches. All human deaths from rabies in Africa and Asia are caused by dogs. In the Americas, and more recently in Western Europe and Australia, most rabies deaths are caused by bats. Rarely, foxes, monkeys, racoons and other wild carnivores can transmit the virus. It must be remembered that these infections constitute a tiny proportion of deaths worldwide. Transmission can also occur when infected material, such as saliva, comes into contact with broken skin or mucous membranes (the inside of the mouth, nasal passages etc). Rabies cannot be transmitted by ingestion of raw meat from infected animals. Touching or feeding infected animals, or licks by such animals on intact skin do not cause rabies. It can take a long time before symptoms appear, typically from 1-3 months. However, the time between infection and symptoms can be as little as a week and as long as 10 years. The virus slowly moves along the nervous system and eventually reaches the brain. ‘Paralytic’ rabies – this is demonstrated by a slower progression, with gradual paralysis spreading out from the wound site, leading to coma and eventually death. Rabies can only be diagnosed once symptoms develop and it is confirmed by identifying the virus or its antigens in tissue samples, such as brain, skin or sometimes saliva and urine. Effective treatment must be given as soon as possible after exposure to rabies, and can prevent the onset of symptoms and death. Local cleaning of the wound – thoroughly wash the wound with soap and water, detergents or iodine, for at least 15 minutes. Post Exposure Prophylaxis [PEP] – this consists of a course of rabies vaccines as recommended by the local virologist/WHO recommendations, and is possibly supplemented by rabies immunoglobulin [antibodies to the virus]. Safe and effective vaccines are available for pre-exposure immunization. These are recommended for travellers spending time outdoors, especially in rural areas, and expatriates living in areas with a high risk of exposure. Children are at higher risk because they are more likely to play with animals, and may not report bites or licks to broken skin or mucous membranes to an adult. The proven solution to eliminate the rabies burden is to introduce national rabies vaccination campaigns. Most of Europe and America have eradicated rabies from the dog (and human) population via the systematic vaccination of pets. It’s cheap to do this (as little as 20 US cents per dog if done on a large scale). If 70% of a local dog population is vaccinated, the number of canine rabies cases rapidly decreases, and when rabies in dogs is eliminated, the threat to humans is removed. In 1983, the countries of South America started a policy of mass dog vaccination and the number of dog rabies cases in the region fell from a peak of 25,000 in 1977 to just 196 in 2011, and human cases fell by 96% to only 15 across the whole continent. 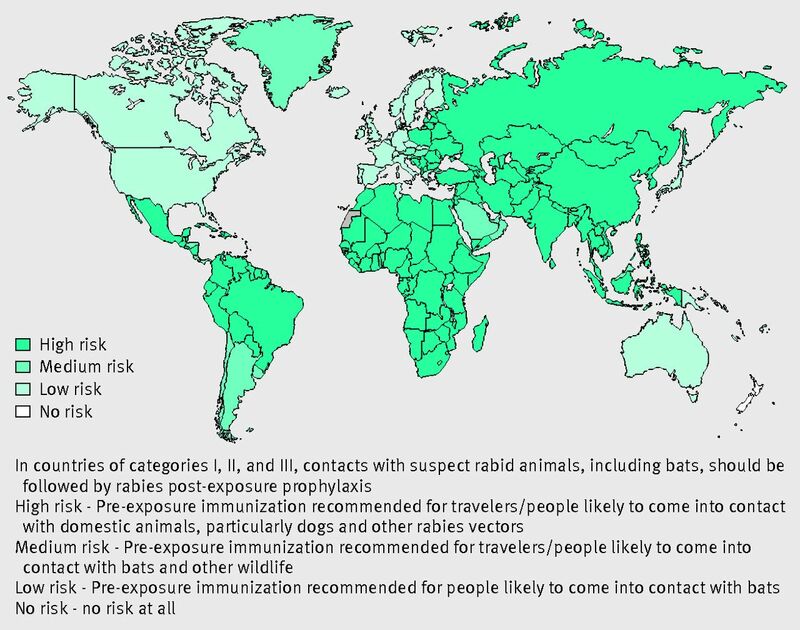 Terrestrial rabies has the potential to be eliminated, but this is unlikely to happen to bat rabies, which accounts for a very small proportion of cases in humans each year. Bats are an essential part of the ecosystem and protected by law in many countries. Rabies vaccination would be effective in bats, but there is no means of delivering it. The World Health Organization has set targets for elimination of human and dog rabies in Latin American countries by the end of 2015 and of human rabies transmitted by dogs in South-East Asia by 2020. It is hoped that by 2030, there will be a global eradication of human rabies. Poor people are at highest risk. They often live in isolated locations with limited medical care and no access to vaccines, let alone immunoglobulin. Children are most often affected. Virologists are continually analysing tissue samples from rabies infections around the world and finding new forms of the virus. In 2011, another new strain of rabies was identified. A Norwegian woman on one of the islands of the archipelago, mid-way to the North Pole, was bitten by a rabid Arctic fox. A local dog, acting in a wolf-like manner, killed the rabid fox but then acting in a more dog-like manner, proceeded to lick the hands and faces of four people who all developed this new strain of rabies. The outbreak ended a month later in the deaths of eight reindeer and two foxes and the emergency vaccination of hundreds of residents. The rapid identification of the infection and administration of the vaccine prevented any human deaths. 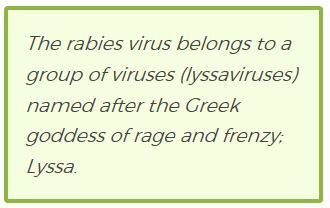 New strains of rabies continue to emerge but, nevertheless, the rabies vaccine that has been around for 125 years remains almost 100% effective if given pre-exposure. Written by Dr Adrian Hyzler, Chief Medical Officer and Dr Simon Worrell, Head of Medical Communications, Healix International.